With a crushing $13 billion in unfunded healthcare liabilities, LA Unified and its employee unions return to the negotiating table Monday still far apart — unions want increases in health benefits, the district wants to stop the bleeding — so the district is coming prepared. This month it secured the blessing of the school board to file a complaint against the teachers union if talks break down. What’s not on the table is cutting benefits. District negotiators already agreed they wouldn’t, even though LA Unified faces a structural deficit in three years. But the district is holding the line to keep costs from rising. It wants to keep healthcare costs stable at $1.1 billion annually through 2020 and proposes tapping a reserve fund to do so. The unions’ proposal would increase those costs to $1.25 billion by 2021, and it rejects relying on that fund. LA Unified employees have among the most generous health benefits for public employees in the nation. Employees and their dependents do not pay premiums and have lifetime benefits. United Teachers Los Angeles leaders have said they are prepared to strike if negotiations don’t go their way. So the district this month sought and won authorization from the school board to file a complaint if talks unravel. The 5-1 vote in closed session, with Scott Schmerelson voting no and Kelly Gonez absent because she was representing the board at a California School Boards Association conference, authorized the district to file an unfair labor practice action with the Public Employment Relations Board if UTLA stops negotiating. In an interview, the district’s chief negotiator, Najeeb Khoury, said UTLA so far is willing to come to the bargaining table, with negotiating sessions scheduled through January, so the district does not have plans to file the complaint. “At this point, we don’t think it’s necessary,” Khoury said. Alex Caputo-Pearl, president of United Teachers Los Angeles, had threatened to create a “state crisis” in early 2018 around contract negotiations throughout California. Contracts expired in June for teachers and other school workers in Los Angeles, San Diego, San Bernardino, Oakland, and San Francisco. Last week, San Francisco settled with its teachers union and Oakland approved $9 million in budget cuts, but negotiations continue in the other cities. However, no coordinated action has been seen so far. He described a series of actions, including a paid media campaign, which launched earlier this year. 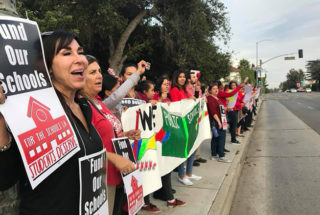 The union has held a number of pickets at school sites in Los Angeles rallying to keep their healthcare benefits intact. “This is very significant progress, and it is a direct result of our organizing and escalation,” he wrote in a November post on UTLA’s website. In its proposal submitted to the employee unions in October, the district agreed to not make any changes to employees’ healthcare plans, but rather than automatically paying for increases in healthcare costs, officials want to draw on a $250 million reserve fund that has been created as the district has set aside more for healthcare costs than it has spent. The employee unions want the district to fund the increases through larger contributions to healthcare benefits rather than draw down the reserve fund. At that bargaining session, the district offered to keep funding benefits at the same level that the district has funded this year — $1.1 billion. Typically, the district has automatically funded increases in healthcare costs, which rise about 4.5 percent each year. The employee unions returned to the bargaining table before the Thanksgiving break with a counter-proposal that asks for a 4.57 percent increase in contributions from the district for 2018, and a 3 percent increase for each of the three following years, according to district spokeswoman Shannon Haber. The unions have come down from their initial proposal, which asked for the same 4.57 percent increase in contributions for 2018, a 7.9 percent increase for 2019, an 8.4 percent increase for 2020, an 8.2 percent increase for 2021, a 9 percent increase for 2022, and a 9 percent increase for 2023. The district estimated that original proposal would have cost about $1.6 billion by 2023. LA Unified says it will save $65 million annually over the next three years with its proposal by not automatically funding increases. The lead negotiators for the unions did not respond to requests for comment. The district negotiates healthcare benefits with all of the eight employee unions at once. Those unions are UTLA, Associated Administrators of Los Angeles, California School Employees Association, LA County Building and Construction Trades Council, LA School Police Association, LA School Police Management Association, SEIU Local 99, and Teamsters Local 572. The district then negotiates the rest of the contract, including salary, individually with each union. As the district faces a budget deficit due to declining enrollment, some school board members have suggested that adjustments need to be made for new employees. The district held a deep-dive session this summer exploring different ways to cut or adjust benefits to save money but has not publicly made any decisions. The district faces a $13.6 billion unfunded liability for retiree healthcare benefits. During that presentation to the school board, budget officials showed board members a sobering graphic — that by 2031-32, half of the district’s general fund budget would be spent on healthcare benefits and pension costs. Under the district’s proposal at the bargaining table, however, that target would move beyond 2031-32. District officials said that projection assumed that the district would pay for automatic increases in healthcare costs, which it is now trying to halt. School board vice president Nick Melvoin said in an interview that the district’s proposal to freeze its spending was “a big deal” and unprecedented. Melvoin said he would like to see a “cost neutral” deal for the district for this negotiating session and then look at how to reduce the district’s $13.6 billion liability for retiree healthcare benefits in the future. The district needs to “stop the bleeding,” Melvoin said. Typically the district has negotiated healthcare benefits and salary with employee unions separately. But Melvoin said he would like to see the negotiations happening simultaneously. And parents want to participate too. Last month parents and community members asked the school board for a seat at the table during contract talks. *UPDATED to add that Gonez was absent from the meeting because she was attending a California School Boards Association conference.